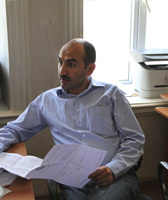 Mr. Abdullayev has been extensively active in the legal community in Azerbaijan including chairing the Democratic Institutions and Human Rights Social Union as well as serving as the director of Service Center for torture victims. His anti-torture activities have included heading a project designed to aid torture victims as well as conducting trainings for various actors in the criminal justice system to protect human rights. In addition, Mr. Abdullayev’s experience extends beyond legal work to include health projects such as being a member of a monitoring group entitled “Call for Health” NGO Alliance. In addition to Mr. Abdullayev’s legal career and involvement in the community, he has also has extensive knowledge in law and economics. He has participated on a project to monitor the socio-economic effects of a pipeline as well as examining gender discrimination in the political socialization process. Through the combination of these extensive and varied activities, Mr. Abdullayev has come to understand the rapidly spread of HIV/AIDS in Azerbaijan and the implication this has had on the prison population in the criminal justice system. HIV/AIDS is rapidly spreading in Azerbaijan as the country is one of the leading countries in intravenous drug use and addiction. In addition, there are 17,000 incarcerated people in Azerbaijan and more than 60% of them are imprisoned because of using and/or selling drugs. Even faced with such a growing problem, the Azerbaijan government has not done enough to curb the spread of HIV/AIDS in the prison system or implemented enough penal reforms to effectively counter the use of intravenous drug use. While some laws exist about protecting prisoners’ health, real obstacles exist in obeying these laws on a daily basis as Azerbaijan does not have the resources or capability to execute these laws and ensure adequate protection for prisoners. As HIV/AIDS rapidly spreads across Azerbaijan due to heavy use of intravenous drugs, prisons are finding themselves increasingly populated with individuals who have HIV/AIDS and are unable to properly care for them. In addition, while laws exist to protect and care for individuals with HIV/AIDS, such as requiring early release of inmates with serious cases or transferring HIV/AIDS individuals from ill-equipped prisons to prisons better equipped to handle their complicated health issues, there are real issues at the government level in obeying these laws. The primary reason for their inability to obey these health laws is that its public health oversight agencies are not involved and therefore there is a tremendous need to develop initiatives and take serious steps to protect the health of prisoners in Azerbaijan, and particularly those with HIV/AIDS. The Project: Mr. Abdullayev used his JusticeMakers Fellowship grant to detect HIV/AIDS in prisons and provide counseling and care for these individuals. In addition, Mr. Abdullayev directly involved himself in protecting the rights of HIV/AIDS prisoners by performing advocacy work on behalf of prisoners and petitioning for the release of infected prisoners per Azerbaijan law. Through these efforts, Mr. Abdullayev hoped to increase public attention about HIV/AIDS in prisons as well as increase the possibility that infected prisoners will receive proper medical treatment. Furthermore, through the advocacy part of the project Mr. Abdullayev sought to increase awareness about the rights of HIV/AIDS prisoners in hopes that he can secure the early release of prisoners with serious cases or help secure the transfer of prisoners to facilities that can better care for their health needs. Through this work, the rights of prisoners with HIV/AIDS in Azerbaijan were strengthened and their quality of life significantly improved. Although it was difficult to get cooperation from the various government offices, Mr. Abdullayev was able to carry out research by visiting two prison facilities and a treatment center as well as interviews with former prisoners about the treatment and conditions within prison.